Christians are ALWAYS learning - about God, themselves, each other, the Bible, and the world. In fact, we're NEVER done learning, because the world is constantly changing, and so are we! As author Anne Lamott so famously put it, "I do not understand the mystery of grace -- only that it meets us where we are and does not leave us where it found us." Learning is an important part of a life of faith, because it helps us live well in community and follow Jesus as we grow and change. 1. From September - May: Sunday School, on Sunday mornings from 9:00-9:45am. Middle School students meet in the library, down the hall from the office. You'll be learning about the Old Testament/Hebrew Scriptures this year, with five units of classes. Each unit has five regular lessons and one review lesson to help you put it all together. The units are: Beginnings, The Promise, Freedom, Kings & Prophets, Conquered. Chances are good you have a pretty decent understanding of the first couple units from your elementary Sunday School days. The rest may be quite new, so stick with it! Your parents will join you in class three times this year (September 20th, January 10th, and May 8th). High School students meet in the "upper room." Each Sunday this fall you'll join John and Kristin and tackle some big, contemporary questions of faith. Can I Ask That? and Can I Ask That? volume 2 are books covering questions like "Does the Bible contradict itself? "; "Can I be a Christian and believe in evolution? "; and "Why do bad things happen to good people?". It's going to be a great year of discovery and conversation. Invite your friends to join you! 2. From September - May: Youth Group, on Wednesday evenings from 6:00-8:00pm. CtK youth (and friends!) in grades 6-12 gather on Wednesday evenings for dinner (please bring $2/person), and some combination of: service opportunities, games, conversation, projects, Bible study, prayer, activities, movies, field-trips, music, crafts and more. Friends are ALWAYS welcome. If the evening involves an off-site activity, each CtK may invite one friend to join the fun, and friends must also turn in medical authorization/release forms. Fall 2015: We're talking about relationships. The good, the bad, the ugly of "Family, Friends and Falling in Love." We've all got family - parents, grandparents, sometimes siblings. And friends. Even with the occasional drama. While falling in love may not exactly be on your radar right now, chances are good you know someone with a boy/girlfriends. Or a crush. And media sure have a lot to say about romance is "supposed" to be like. We'll talk about it all, and how our faith helps us live in relationships, too. Now that it's Advent, we're taking a break from Youth Group on Wednesday nights - bring your family for Soup Supper at 6:00pm, then stick around for Holden Evening Prayer on 12/2, 12/9 and 12/16. Youth Group resumes on January 6th! 3. Faith Formation at Home, every day, all the time, at your home, or wherever you might be. Every time is the right time to learn. And let's face it, you learn WAY MORE at home than you do anywhere else, though much of that learning isn't "formal" - you probably don't even realize you're learning! 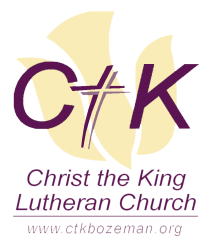 CtK is working on helping families grow in faith together, by providing resources and ideas to help parents teach and share their faith with their kids. YOU might encourage your parents to share their faith with you.